When Senator Richard Gordon said, "[Leyte Mayor Rolando Espinosa Sr.] was already incarcerated and nonetheless [it's] still not safe. It’s a slap in the face of the criminal justice system of our country," he wasn’t wrong. This bears repeating: Gordon is right. Espinosa’s death is indeed a slap in the face of our country’s criminal justice system. But before I join the mob condemning this party and that, I feel it’s just right to evaluate the situation given what we know, so let me do that. This is how I will do it: I will list down all the major events leading to the Espinosa’s death. Paragraphs in red contain my observations. The wealthy Rolando Espinosa was on his first term as mayor of Albuera Leyte. The Philippine National Police says his son Kerwin is the biggest drug lord in Eastern Visayas. Late July: Two of Mayor Espinosa’s bodyguards were arrested in a buy-bust operation after they were found to have 237g of shabu (meth) worth P1.9-million (US$ 39,000) [ABS]. 01 August 2016: President Rodrigo Duterte gave Mayor Espinosa 24 hours to surrender. Should Espinosa fail to surrender, a ‘shoot on sight’ order would be given if he resists and endangers the lives of arresting police officers [GMA]. 02 August 2016: PNP Chief Ronald “Bato” dela Rosa presented Espinosa Sr to the media and announced that Espinosa admitted to his son’s involved in the illegal drug trade. Contrary to an Inquirer report, Espinosa Sr did not admit criminal involvement [Philstar], so Dela Rosa cannot arrest Espinosa Sr yet because the outstanding warrant of arrest is for Kerwin instead. 03 August 2016: Albuera Police Chief Jovie Espinido said he has already spoken to Espinosa in July, suggesting that the mayor  donate all his property to charity,  surrender all his firearms and shabu,  resign, and  surrender his son Kerwin [ABS]. Six hired men of arrested Espinosa Sr. were killed during a police operation against illegal drugs in the family compound early in the morning [Inq]. 04 August 2016: The PNP was informed that Kerwin Espinosa sent surrender feelers, although no timeline has been set for his surrender. Dela Rosa promised to give Kerwin "humane treatment" and that he is even willing to fetch him at the airport once the latter returns to the country. [GMA]. 05 August 2016: Kerwin Espinosa’s alleged right hand man Julito Prak was killed in a police buy-bust operation in Cebu City [GMA]. On the same day, the PNP Criminal Investigation and Detection Group (CIDG) filed drug trafficking charges at the Albuera prosecutor’s office against both Espinosas [ABS]. 06 August 2016: Dela Rosa said that Espinosa Sr. left the White House (dela Rosa’s residence) after his son, Kerwin, failed to surrender on Friday 05 August. Dela Rosa said that out of pity, he allowed the Espinosas to stay in one of the rooms in the White House. He said the Espinosas wanted to stay at the White House because they do not want to return to their home due to threats and Mayor Espinosa wanted to be there when his son surrenders [GMA]. Duterte indeed ordered Espinosa Sr and son Kerwin Espinosa to surrender in Camp Crame, and Espinosa Sr indeed showed up. However, the fact remains that they cannot be put into custody unless there  an arrest warrant against Espinosa Sr or  Espinosa Sr admitted to a crime. Neither is the case, that’s why PNP Chief dela Rosa had to let Espinosa Sr go. For safety, Espinosa Sr wanted to stay in the “White House”, the PNP Chief’s residence, but he cannot have his cake and eat it too. He didn’t turn his son in, he didn’t admit complicity to a crime, but he wants extra-special protection. That isn’t how it works. Espinosa Sr is a town mayor whose son is a drug lord that has been arrested before on similar charges [Philstar]. There’s no way he could not have known anything about it. 10 August 2016: A police buy-bust operation in Espinosa Sr’s home yielded 11 kg of shabu worth P88-million (US$ 1.8 million). The police also discovered bomb-making components in the mayor’s home [DZRH]. You may want to argue that Espinosa should’ve been arrest right after this, but warrantless arrests can only be performed when “in (an arresting officer’s) presence, the person to be arrested has committed, is actually committing, or is attempting to commit an offense [LawPhil]”. Neither Espinosa Sr nor Kerwin Espinosa were there during the buy-bust operation, so they cannot be arrested. Moreover, the police cannot just arrest them AFTER the operation because of this same rule on warrantless arrests, i.e. the police had to have an arrest warrant to effect an arrest against the mayor. 11 August 2016: One of Kerwin Espinosa’s alleged sources of illegal drugs, murder convict Edgar Allen Alvarez, was killed by police in an operation inside a Leyte prison, where he was transferred in 2011. Alvarez was originally detained in the New Bilibid Prison. While in detention, Alvarez allegedly lobbed a grenade that failed to explode, then fired at cops using a 0.45 caliber pistol. The police fired back, killing Alvarez [GMA]. This really sounds fishy. How can a detainee possess a grenade while in prison? But as it turns out, it appears that Alvarez is doing a Colangco-type operation in the Leyte Jail, so the search is not entirely unjustified, so far. 16 August 2016: With no formal charges against him, the Espinosa Sr has gone back to work as Albuera mayor [GMA]. He stayed at the town hall day and night for about a week before he asked for police protection [Sun.Star]. Espinosa Sr has yet to admit criminal involvement and no warrant of arrest was issued against him so what else would he do but go back to Albuera and live his wretched life? That’s exactly what happened. 23 August 2016: PNP’s Espinido met with Espinosa Sr in another closed-door meeting at 12:35 pm. Espinosa Sr said he’s now willing to cooperate with him for his son's surrender and that he will convince his son to surrender once he calls him [ABS]. At 2:00 PM, Espinosa Sr lawyer Rogelio Bato Jr. was killed in Tacloban, Leyte [ABS]. 24 August 2016: Espinosa Sr voluntarily went to the Leyte Provincial Prosecutor's office to execute an affidavit naming his son Kerwin's connections and protector. The mayor admitted getting a lot of death threats [TV5]. 25 August 2016: Driven by fear for his life, Espinosa Sr started to hold office in the Albuera Police Station [Sun.Star]. 30 August 2016: Espinosa Sr slightly nodded when asked if his affidavit listing his son Kerwin’s coddlers includes Senator Leila de Lima [Politiko]. 31 August 2016: Police said that a senator was in Kerwin Espinosa’s ledger of drug connections. Espinosa Sr. could not give the names in fear for his family’s safety [CNN]. On the same day, Kerwin Espinosa underling Tonypet Zaldivar surrendered to Albuera Police [Inq]. Espinosa Sr was probably horrified after learning about his lawyer’s murder, and this prompted him to go to the prosecutor’s office to spill the beans. His request for police protection was most probably granted because he’s still a mayor who is entitled to police protection. Espinosa Sr and Espinido did not explicitly say who that senator is. They have, however, dropped two hints:  Espinosa Sr’s slight nod when asked if it’s Sen. Leila de Lima and  Espinido’s statement that the senator is a former Justice Secretary [CNN], which basically narrows down the list to either Sen. Drilon ( who was Justice Secretary in 1992) and yes, de Lima. Whichever is the case, Espinosa Sr has now become a marked man. It’s a given that he’s certainly a prime target for assassination by those who want to cover their tracks, i.e. those who Espinosa implicated in that affidavit. Early September: Espinosa as State Witness? 01 September 2016: Malacañang said it mulls turning Espinosa Sr into a state witness. However, Justice Secretary Vitaliano Aguirre II on Thursday said Espinosa has yet to apply to be included in the witness protection program of the government. Aguirre said the Department of Justice (DOJ) has yet to receive a “formal request” from the mayor [Inq]. Espinosa may testify versus “a senator, 29 others” [MS]. 02 September 2016: PNP Region 8 immediately relieves at least 15 Eastern Visayas cops after being implicated by Espinosa Sr in the latter’s sworn affidavit [Star]. 05 September 2016: Espinosa Sr filed a counter-affidavit in the Ormoc Regional Trial Court with the aim to halt the court from issuing a warrant of arrest against the mayor [ABS]. 14 September 2016: Albuera PNP Chief Espinido said at least 74 government officials and 154 civilians will face charges for allegedly protecting the illegal drug operation of Kerwin Espinosa, who has been tagged as the biggest drug lord in Eastern Visayas [CDN]. So there are over 200 more people who may want to kill Espinosa Sr before the latter incriminates them further. 19 September 2016: PNP announced that they have just acquired a new state witness who can be used in the prosecution of suspected drug lord Kerwin Espinosa, son of Albuera, Leyte Mayor Rolando Espinosa [CDN]. The Justice Department may have found some value in turning the marked man Espinosa Sr into a state witness. Aguirre has two options on this matter:  use Espinosa Sr to pin Sen Leila de Lima or  ditch the idea and rely on other witnesses so Aguirre can go after Espinosa Sr. I think this is a difficult decision for Aguirre, especially since he has yet to capture any big fish, and Espinosa Sr is a big fish. With Jumbo’s surrender, Aguirre can now choose the second option, but Aguirre has not made any subsequent announcements. 23 September 2016: Kerwin Espinosa right hand man Max Miro surrenders to Albuera police, turns over P24 million worth of shabu (US$ 494,000) [CNN]. 30 September 2016: Cebu Provincial Police Office (CPPO) Dir. Jose Macanas was relieved from his post amid Espinosa Sr’s allegations linking him to the illegal drug trade [CDN]. Here’s another person who may want to kill Espinosa Sr before the latter incriminates them further. Remember Espinosa Sr has yet to admit complicity so he cannot be arrested sans a warrant. 01 October 2016: Kerwin Espinosa ex-wife Annalou Llaguno was shot by an unidentified gunman [Sun.Star]. It appears that the “evidence cleanup” has begun. But on the flip side, Llaguno was also romantically involved with the slain drug lord Alias Jaguar, so we cannot rule out that alternative angle yet. 05 October 2016: Espinosa Sr was arrested then detained at the Leyte Sub-Provincial Jail in Baybay City. Espinosa’s son Kerwin remained at large, with a source from the Bureau of Immigration saying he flew to Malaysia in June [GMA]. 07 October 2016: PNP taps Interpol in hunt for Kerwin Espinosa, who is still at large [Tempo]. 12 October 2016: Espinosa pleaded not guilty to the illegal possession of firearms while his lawyer filed a motion to quash, or make the warrant of arrest invalid for his drug case [Sun.Star]. 16 October 2016: Abu Dhabi police arrests Kerwin Espinosa [Gulf]. Kerwin cannot be flown back to the Philippine right away because he still has to go through extradition proceedings in the United Arab Emirates. 18 October 2016: Espinosa Sr seeks bail and requests for transfer from the Baybay sub-provincial Jail back to Albuera police station under Chief Insp. Jovie Espenido due to threats to his security. The presiding judge warned Espinosa Sr’s lawyer Leila Villarino not to again delay proceedings [Inq]. 19 October 2016: Espenido links Kerwin Espinosa to drug kingpin Peter Lim [Sun.Star]. 24 October 2016: The Philippine Ambassador to the UAE said Kerwin Espinosa’s extradition proceedings may take up to a month [Abante]. 27 October 2016: Whistleblower Sandra Cam said Kerwin Espinosa will name his politician protectors once he is repatriated to Manila [Gulf]. The people mentioned in the Espinosa ledger should be panicking already. 29 October 2016: Ten police officers, including the former provincial police director of Cebu and a policeman still in active service in Cebu City, are undergoing administrative investigation for their alleged links to Kerwin Espinosa [CDN]. 29 October 2016: On the same day, Espinosa drug group member Fernando Balagbis was killed during an alleged shootout with policemen who raided his cell in Baybay City Jail in Leyte. A team of policemen went inside his cell early Friday to serve a search warrant[CDN]. 03 November 2016: Dela Rosa said Kerwin Espinosa may be repatriated by the second week of November [Abante]. Dela Rosa also said Kerwin Espinosa is key to implicating retired PNP General and Daanbantayan Mayor Vic Loot [Abante]. 04 November 2016: Espinosa Sr was killed inside the cell at the Baybay City sub-provincial jail where he was detained after he allegedly fought back against police agents seeking to serve a search warrant for "illegal firearms" on him early Saturday morning [TV5]. Let’s analyze a bit more. Kerwin Espinosa was arrested during a CIDG buy-bust operation on 04 March 2010 [PhilStar], or four months prior to former President Benigno (PNoy) Aquino’s oath of office, also four months prior to Sen. Leila de Lima’s appointment as Justice Secretary. Interestingly, this Espinosa never appeared on the news for the entire duration of the PNoy presidency. Given that he was able to flee to the UAE in June 2016, I think it’s clear that charges against him were dropped by the de Lima herself, as she was still the DoJ secretary at the time. You see, those with criminal records are put on the DOJ-Bureau of Immigration’s Hold-Departure List, and his ability to fly to the UAE means no pending criminal record exists. Adding fuel to this theory is the story of murder convict Edgar Allen Alvarez who was originally detained in Bilibid but was then moved to Leyte in 2011, enabling him to become Espinosa’s illegal drug supplier. This transfer happened under the tutelage of de Lima’s Justice Department. Did then-Justice Secretary de Lima let go of Espinosa and even provided him with a supplier, or was this a mere coincidence? 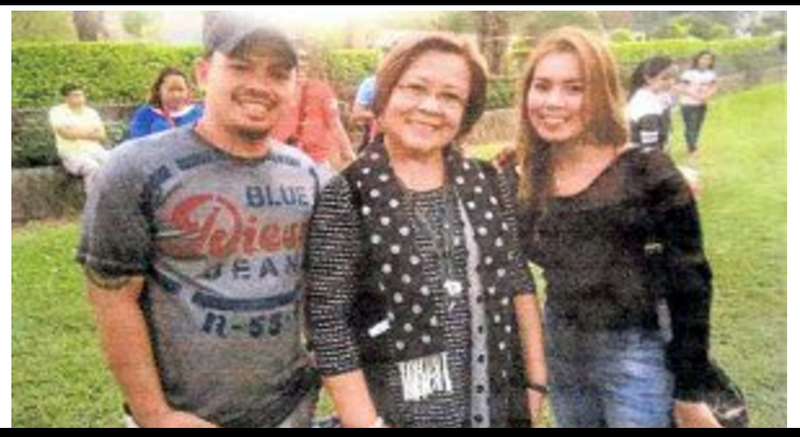 Is Kerwin Espinosa and Leila de Lima March 2016 encounter in Baguio City also a coincidence? Well, Espinosa Sr seems to have mentioned de Lima in the ledger, so I think we have a bit of an idea about the answers here. 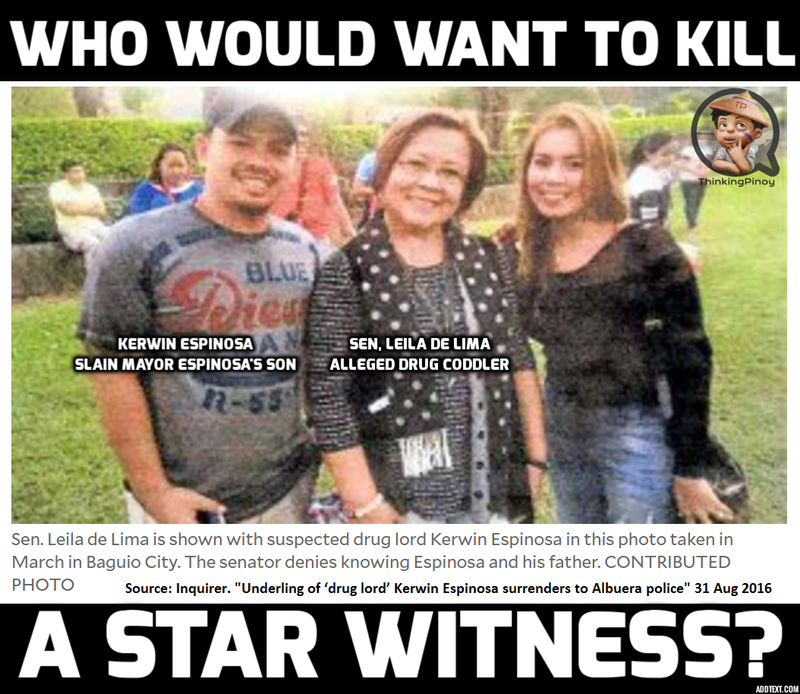 So did de Lima and her cohorts have a hand in killing Espinosa Sr? Mayor Espinosa has been scared for his life since July 2016. He was so scared that he even insisted on staying in the PNP Chief’s residence when he “surrendered” in early August. The problem, however, is that Mayor Espinosa wanted to have his cake and eat it too. He wanted extra-special police protection, but he didn’t want to turn himself in. Yes, he implicated his son, but he did not implicate himself. Basically, he wanted to stay alive AND evade criminal liability at the same time, even if everybody agrees that he’s most likely involved in his son’s life of crime. Espinosa Sr knows his son was arrested on drug charges in 2010. Second, he pleaded not guilty on illegal possession of firearms BUT he simply asked for a quashal on the drug charges, i.e. he wanted the drug charges dropped based on technicality. Why didn’t he just say he’s not guilty on the drug charges too? Now, just for the sake of argument, let’s assume that Espinosa Sr really has nothing to do with drugs even if it’s very unlikely. August reports show his fear is real, so why didn’t he just pretend he’s guilty and offer to surrender ON THE CONDITION that he will be detained in the Camp Crame or in the NBI detention facility, where he will most likely be out of reach from corrupt policemen who want to silence him before he talks in length? But he did not. And when he was arrested in early October, why didn’t he even attempt to ask for a transfer to Crame or NBI? He was detained in Baybay City in Leyte, well within the reach of the cops he implicated. Has he given up on his life or those of his daughters? Or was he simply not very smart? Espinosa Sr is a politician, but his inexperience in politics reared its ugly head, with fatal results. I do not blame PNP Chief dela Rosa for his August 2016 decision to evict Espinosa Sr from the “White House” given the circumstances at the time. I also do not blame him for the delayed arrest of Espinosa Sr, as Bato was just following the rule of law which mandates that he cannot order arrests without a warrant. Yada yada yada. Heck, I do not even suspect that national government had Espinosa Sr killed. We all know that Justice Sec. Aguirre is fixated on putting Sen. de Lima behind bars, and eliminating Espinosa Sr, who should know a lot about de Lima's involvement, is a bad idea. However, what’s confusing for me were the events that happened recently. Espinosa drug group member Fernando Balagbis has been in detention since his January 2016 [PDEA]. He was killed during an October 29 shootout with policemen who raided his cell in Baybay City Jail after the police allegedly received information that he was selling drugs inside the facility [GMA]. But why the hell did PNP Chief dela Rosa take a vacation at such a critical juncture? PNP Chief dela Rosa arrived in Las Vegas on November 5 local time, so that’s November 4 in the Philippines, i.e. he must have left the Philippines for Las Vegas on or before November 3 [GMA], a couple of days after Balagbis' death and a day before Espinosa Sr's. Why is he in Vegas? To watch Manny Pacquiao fight later today at 10:00 AM. Yes, PNP Chief Bato took an official leave to watch Manny fight. Asked to comment about Espinosa Sr’s death, dela Rosa said he ordered an investigation – while he was still in Las Vegas. For an issue this critical to the political survival of the Duterte Administration, PNP Chief Bato opted to watch the Manny Pacquiao fight instead of flying back home right away to see what happened. PNP Chief Bato, I like you, I really do, but our President is already killing himself with his schedule while you, his subordinate, took a vacation. Think about it. what will the international community say about this?